I´m just getting to know my luckily found ACL II. So far I dont´t have a battery for it. Since I lack a decent understanding of the matter, could someone maybe kindly point me to a link to what kind of low budget battery & charger would I at least need? I suppose I´d like to use velcro to attach the battery to the side of the camera. And I´d like to use 400ft mags. this would velcro to the side of your mag. Mine came with several dead original batteries, one of which I recelled, only to find that the charger was also dead. So I ended up adapting a lead acid motorcycle battery, which worked great. It's a little heavy, but it runs forever. I put it inside a soft case for a small camcorder, which has a shoulder strap. That makes it a lot like the originals, only bigger. 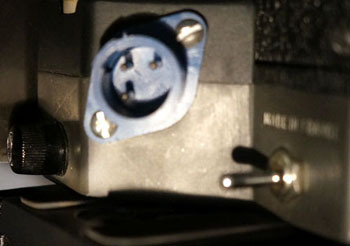 I also put in an automotive-style 12v socket (like you'd have for a cigarette lighter), and then made a power cable that connected to the port on the side of the camera, and that makes it easier to break down and store away, plus it adds flexibility if you want to make longer cables (by not having it hardwired). If you want to attach it to the camera you need something lighter than lead acid batteries. If you can't find a 12V pack that you like you could make up your own using cells with solder tabs. Just wrapped up in gaffer tape with a 4 pin cannon on a short lead to plug straight in the camera. Just looking at a cable here, I have pin 1=neg, pin 4=pos. Just double check that in the manual, though I think the fuse in an ACL-II may save you. NiMhi might be a good choice nowadays. Right - lead acid is no good for onboard batteries. At the time I made mine (in the late-90s) it was the cheapest option and I didn't mind too much about that. The original Eclair batteries are a bunch of Sub-C cells inside those black plastic enclosures, so it should be possible to make something that's a similar size by using these. They can be purchased at most stores that sell electronic components. unlike regular C-cells, they have solder tabs instead of the usual protrusion on one end of the cell. So you have to be careful to get the polarity correct, and of course you have to solder them together. They're smaller than regular C-cells too. I used to hand hold an ACL I with a separate battery. I liked the light weight. But I think it put some stress on the Jaeger connector that went onto the camera. 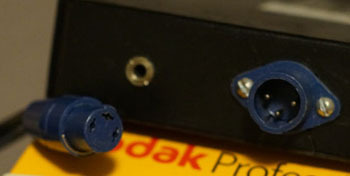 The Canon 4 pin on the ACL II feels more robust and cheaper, easier to fix. Have you tried putting your lead acid battery into a "bum bag" (money belt, phany pack)? I think mine is about 2' long coiled, and maybe 4' long stretched out. I never had any problems with strain on the camera's power connector. The weight of the battery (about 5lbs) isn't bad if you put the strap across your shoulder, and it actually came in handy a couple times in helping to stabilize a lightweight tripod I had to use on a shoot (gave it some extra weight!). For my Aaton I made a Ryobi 18v Lithium Ion battery to Aaton adapter with a Ryobi flashlight and the casing of a old Aaton battery, this goes onboard the camera. Power drill batteries and chargers are far better than the older style batteries and you don't need a battery belt which is cumbersome. A 12v Lithium power drill battery can be fitted to an ACL easily and will pull many many mags. Figure I'll tag along here rather than start a new thread. I recently bought an ACL 1.5 but it's battery cable connector is three pin. Is there an adapter for this or am I going to have to have the camera modified? Four pin Jaeger or four pin Canon XLR is normal. For the ACL II it was Canon on the camera and Jaeger on the batteries. ACL I had Jaeger on the camera and Canon on the batteries (my Anton Bauer batt's 1did). The 1.5, don't know. What is meant by unstable? If the old nicads are not taking or holding charge they can be recelled. You could switch to NiMhi cells in the same onboard battery cases if you wanted to, but I think you will be deleting the extra circuitry that the factory charger refers to. And you will need a new charger of course. To be safe, can you post a pic of the power connections on camera and battery. Here's pics. Looking at it now, I'm thinking that this was a modification by George at Optical Electro House when he did the S16 conversion. Perhaps I'll just have the camera converted to 4 pin. Was just looking in the case at the other batteries and realized that there's a 3 pin to 4 pin adapter in there. D'oh! I'm hoping that means I can get a regular Bescor or something to fire this thing up! I bought for my new used BMPCC a XTPower MP-10000 li-pol battery and decided to try if I could use it with my Eclair ACL as it provides 12V power. I have discovered my earlier batteries a bit impractical to use, as they are meant to be carried on one's belt. XTPower, on the other hand seemed perfect for on-board use. I crafted an adapter from 4-pin XLR of my camera (DIY modification) to the 12V output connector of this battery. To install the battery on-board I used 3M Dual Lock tape. So does it work? For speeds 8-25 fps, yes. 50 fps seems to draw too much current and the battery shuts down. No surprise though, as the max current for 12V is 2 A and apparently for 24 fps the heavy duty motor draws some 1.1 A. Correction: my experiment turned out to be a fiasco. The battery shut down even with 25 fps with film loaded. It just couldn't give enough current. Better idea to just stick to NIMH batteries. Chris, have you tested your battery pack to find out which of the pins is ground and which 12V? Once you find that out, building new battery packs is rather easy. I recelled myself all of the batteries I received when I bought my camera. Have to take my hat off to anyone who calls his experiment a fiasco. But maybe there is no bad result to a true experiment. If we had a prefered outcome then perhaps it was not an experiment in the begining. This happens so often...! Starting over on the battery issue. The origional NiCads were fine, excxept that these cells can have "memory" issues if not discharged enough during the cycle. Easy enough to work around, but if battery use is intermittent, then other cell types may be easier to maintain. NiMhi sound like a good direction. Maybe LiPo is also worth a look. Some cheap stuff ex China in both categories....worth exploring.....it's a lottery from China...anyone who thinks that we get what we pay for (from China especially) is one degree removed from fact, common sense. I want to wake up this thread again since I am trying to make my Eclair and option for the people I work with. We usually have access to 416's, and SR3's, but the old guys in the business that I spoke to, says that the ACL should be able to play with the big boys any day of the week. Now to my point, I am currently running mine on 2 Ni-Mh converted batteries, and it works pretty well if I may say so. But they do then to drain very easily, and not ideal to be used on steadicam. My operator I usually work with, have a guy that makes him cables for ANYTHING, as long as he knows how to order it. And he runs both 24 and 12 volt cameras off V-mount batteries on his sled. The question I have is this. My Eclair 1.5 uses the Jaeger contact, is it possible to make it work with a V-mount setup to run the camera smoothly? If you can make a power cable that is Jaeger contact to 4 pin XLR (the usual 12v power out on a Steadicam, but check) the Steadicam will power your camera. My operator just bought his sled, so he either do 4 pin lemo, or D-tap from V-mount batteries. But same solution can run both the SR3, the 416, and the Arricam LT.
Well, I haven't got any experience with steadicams, but if the batteries do give out 12V, you definitely can run Eclair ACL from that. You'll only need a power cable with the 4-pin jaeger male connector on the ACL side. Building such a cable is easy, sourcing the jaeger connector might not be. Easiest solution might be to source an ACL power cable and then replace the battery end connector with a new one for the steadicam use. How much work would it be to replace the Jaeger on the body to a XLR? Since i know people have done it. I have done it. It isn't that much work, but in order to do it you have to remove the motor first (carefully), then open the camera base and de-solder the connector. As there is no space for a XLR connector in the ACL 1.5 base, you'd need to have a cable "tail" come out of the camera with the XLR connector in its end and then also find a way to block the opening left by the removal of the Jaeger connector -- then secure the wires inside so that you don't accidentally (by pulling the XLR connector) tear the wires out. This was the more time consuming part of the hack. I can tell the details how I did it if you are interested. Seems like if I stock up on Jaeger connectors I would be better off. Not I just want my ACL to get some hours of shooting.